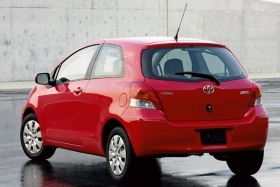 Toyota is studying whether the Yaris subcompact can be built and sold at a profit in North America. (Bloomberg) -- Toyota Motor Corp., the biggest exporter of autos to the United States, is trying to cut production costs for the Yaris and Corolla cars as the yen's advance toward a 15-year high against the dollar makes it unprofitable to build small model in Japan for sale abroad. In Europe, Toyota has a natural hedge against this problem because it makes the Yaris subcompact in France, the Aygo minicar in the Czech Republic as well as the Corolla-based Verso medium minivan Auris compact hatchback in Turkey. Toyota, the world's largest automaker, and domestic rivals are scrambling to combat the surging yen, which is up at least 3 percent against each of the world's 16 major currencies in 2010. Speculation that Europe's sovereign debt crisis will worsen and the U.S. economic recovery will slow has boosted demand for the relative safety of the Japanese currency. Toyota fell 1.4 percent to close at 3,070 yen in Tokyo trading. The yen traded at 85.58 against the U.S. dollar today from 85.51 yen in New York on Aug. 6, when it reached 85.02 yen, the strongest since November 27. The currency is up more than 8 percent against the dollar and more than 14 percent against the euro this year. Toyota sold 325,398 Toyota, Lexus and Scion cars and light trucks imported to the U.S. this year through July, down 15 percent from a year earlier. The total is more than four times the 75,357 imports sold by Tokyo-based Honda Motor Co., which sells the highest proportion of North American-built vehicles among Asian automakers in the U.S. Yokohama-based Nissan Motor Co.'s import sales grew 19 percent through July to 159,904, the second-highest volume after Toyota. For now, Toyota is focused on productivity improvements at its Japanese plants to compensate for exchange-rate swings, Niimi said at the Japan-based company's Texas factory. “By way of technological innovation, we'd like to realize a high level of productivity, as well as a low amount of investment, so we can maintain a system where we can export some vehicles overseas,” he said, without elaborating. While Toyota makes Corollas in Canada, it's exporting more of the compact cars, with a U.S. base price of $15,450, to the U.S. from Japan after a California joint-venture plant that built the model closed in April. The exports will continue until Corolla assembly starts at a Blue Springs, Mississippi, plant that's to open in September 2011, said Jim Wiseman, a Toyota spokesman. Toyota is also studying whether the Yaris subcompact, its cheapest U.S. model with a starting price of $12,605, can be built and sold at a profit in North America. “That's the problem we have to solve,” Niimi said. While demand for small models such as the Yaris will grow, whether sales volume will reach sufficient scale to make U.S. production profitable is questionable, IHS's Nishimoto said. Demand will remain strongest for Toyota's Corolla and Camry models, he said. The carmaker is also planning to start production of Prius gasoline-electric hybrids in Thailand as early as this year, the Nikkei newspaper reported on Aug. 7, without saying where it got the information. Keisuke Kirimoto, a Tokyo-based spokesman for Toyota, said he couldn't comment on future product plans when asked about the report. Nissan, Japan's third-largest carmaker, has already moved some production overseas from Japan, citing the nation's rising currency. The company has begun assembling its new Micra/March small car in Thailand and will start making it in Mexico in 2011. Nissan is also investing $600 million in assembly plants in Mexico to boost exports from that country to Latin America and the United States. Yoichi Hojo, Honda's chief financial officer, said last week if the yen stays at or below 85 to the dollar, Japan can't earn enough from exports to pay for commodities from overseas. “If the Japanese economy is forced to create a production structure based on 85 yen to the dollar, that would be disastrous,” Hojo said. The yen could reach 80 or 75 to the dollar given the current momentum, said Kiyoshi Ishigane, a Tokyo-based strategist at Mitsubishi UFJ Asset Management Co.